The vintage scarves goes great with the poodle skirt or blouse or glasses for retro event. It's a real 50's lOOK! Tie one around your neck, or use it to pull your hair up. 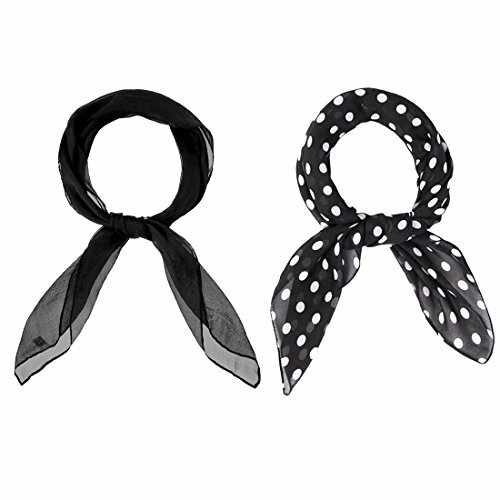 This fashion scarves folds beautifully into a square for easy storing and keep from unwanted wrinkles. Great gift for your friend and your lover. Keeping you pleased and providing you with the friendliest customer service is our priority. This is why we offer you a 90 days money back guarantee in case you are not completely satisfied. Please allow slight color variation due to different monitors. Perfect size: 27.5 INCHES.Extra long and large square scarves in current markets. A great accessories for 50s themed party,halloween costume and daily wear. Multi use:You can wear this vintage chiffon handkerchief around your neck, head，hair, as well as around your hat or handbag, etc. Unisex:the classic 50s scarf is long enough for men, women, girls and teenages,great as a gift too. Chiffon fabric：Super soft,cozy, silky comfortable and non itch that will add the appeal to your wardrobe. Vibrant colors:classic black,red,blue,yellow,white,hot pink,baby pink,black polka dot,red polka dot are available. If you have any questions about this product by MissShorthair, contact us by completing and submitting the form below. If you are looking for a specif part number, please include it with your message.